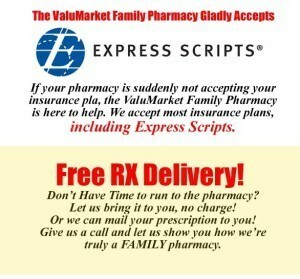 Welcome to the ValuMarket Family Pharmacy. Our professional, registered Pharmacists and Pharmacy Techs are here to make you feel better. When it comes to your health, we deliver the care you need with a family approach. And we can mail or deliver your prescriptions directly to you, free of charge! If you live in Jefferson County, Kentucky or the Mt. Washington, KY area, we will get you your prescriptions right to your door. Give us a call. We’re here to help!